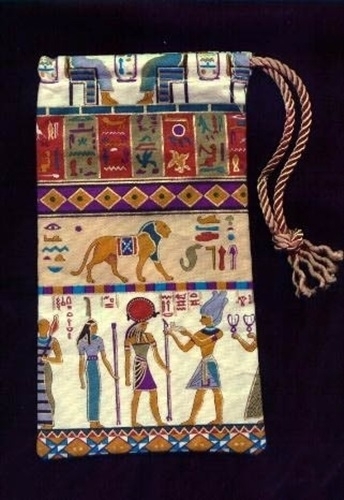 Regular Tarot Bags - Nile Valley Regular Tarot Bag - Tarot Bags, Tarot Cards, Cloths, & More! An abundance of illustrations like those found on the walls of ancient temples and tombs - gods and goddesses, hieroglyphics, priest & priestesses, sistra, stately lions, cobras and ankhs - make this bag perfect for the storage of any ancient Egyptian tarot cards. Ra or Horus, Isis or Ma'at, Hathor, Osiris may be among the deities shown. Pair this bag with decks like the Lo Scarabeo decks by artist Silvana Alasia: Egyptian Tarot, and Tarot of the Ages, Tarots of the Sphynx, and Ramses: Tarot of Eternity is also an attractive match.